> Coherence of environmental policy? > South America: Soy or forests? > Managing change: A key to sustainable livelihoods? Firstly, the horizontal coherence between the various environmental conventions needs to be improved. Goals, standards and rules must be devised in such a way that conflicts are avoided and synergies tapped. Working groups and initiatives aiming at a better coordination between the various conventions are now increasingly promoted, and the ”Joint Liaison Group” of the three convention secretariats is widely acknowledged as a good starting point. 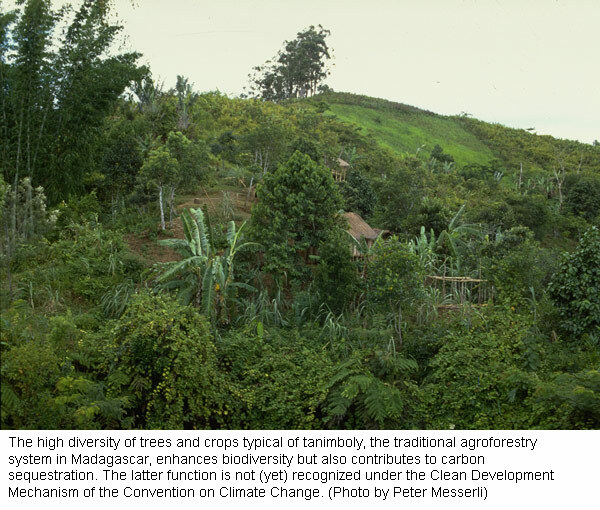 A pragmatic approach at the local level is proposed in a well-devised toolkit entitled ‘Integration of Biodiversity Concerns in Climate Change Mitigation Activities’. In the form of practical guidelines, this document offers simple criteria to support decisions when developing climate change mitigation projects that are also intended to advance biodiversity conservation and thus contribute to achieving the goals of the UNCBD. For example, afforestation of an area in Cameroon can be acknowledged as a contribution to reducing climate change in accordance with the Clean Development Mechanism under the Kyoto Protocol. If this area was previously degraded and is now afforested with indigenous species, the project simultaneously also contributes to the 2010 global biodiversity goals under the UNCBD. Secondly, there is a great need for concerting local strategies and projects with national and international environmental legislation, i.e. for improving their so-called vertical coherence. As the number of global environmental agreements is growing, so is a lack of implementation. This challenge needs to be addressed particularly at the national level, but non-governmental organisations (NGOs) and community-based organisations (CBOs) equally play an important role in implementing environmental projects. A study analyses to what degree current local environmental projects consider themselves contributing to the goals defined under the environmental conventions. Local projects often emerge from local necessities and are not necessarily an outcome of the global conventions. Obstacles to effectively and efficiently integrating the local level into the national and international policy discussion are predominantly linked to a lack of funding, language barriers, or a lack of competence in negotiation among CBOs and NGOs. However, cooperation with government agencies is challenging as well due to the fact that environmental legislation is frequently weak, poorly coordinated, and sectoral, and that funding for local environmental projects is becoming increasingly tight. Integration of social and economic goals into environmental projects is seen as one possible solution to these problems. > Regime interplay: The case of biodiversity and climate change. Joy A. Kim. In: Global Environmental Change Part A. Vol. 14, No. 4, 2004. p. 315–324. Has the project approach in development cooperation become obsolete? Development experts are increasingly coming to realise that projects are not always effective in combating poverty. A joint research programme of the UK Bradford Centre for International Development and partners in South Africa, Tanzania, and Uganda, carried out ten case studies investigating the institutional effects of the Sustainable Livelihoods Approach (SLA) on development interventions. Findings suggest that projects are often isolated constructs with ample financial resources in financially rather limited surroundings. Moreover, projects cause relatively high operational costs in relation to their development-enhancing effect. Last but not least, the study showed that projects often compete with one another. The researchers suggest, among other things, that power relations and steering possibilities in development processes be questioned and changed, and that more partnerships be formed with the private sector. Interventions should be adapted to existing structures, and collaboration with government agencies strengthened at both the local and the national level. According to the authors, development interventions can only change people’s living conditions if longer-term social and ecological impacts are taken into account along with economic and institutional sustainability. To begin with, this briefing paper stresses the importance of industrialised countries playing a pioneer role in reducing CO2 emissions using renewable energy technologies. The focus then shifts to the question of a promotion of technologies that takes into consideration the different conditions in developing and transitional countries. Mainly sub-Saharan countries and others with similar problems (for example, Nicaragua and Haiti). Proposed approach: reduction of both ”energy poverty” and the unsustainable use of biomass fuels. Mainly transitional countries (for example, Albania and Kyrgyzstan). Proposed approach: Improvement of energy efficiency and support of energy market reforms. Heavily populated developing countries with dynamic economies, growing energy demands and rising emissions (for example, Brazil, China, Pakistan). Proposed approach: ”climate change mitigation and energy security”; increasing the share of renewable energy use in the long-term through education, technology transfer, and the strengthening of institutional and legislative measures. These very general distinctions will influence the choice of technologies, partner institutions and the instruments to be used. Krause, Imme Scholz. Bonn, German Development Institute, 2004. 4 p.
While the Asian Pacific region is making progress with regard to economy, poverty reduction, and the health sector, selected indicators point to continuous degradation of renewable natural resources. For example, although Southeast Asia is one of the most widely forested regions of the world and has a rich biodiversity, its forested area has decreased by an average of 1.8% per year during the past 20 years, with the corresponding negative influence on biodiversity. Cross-border air pollution due to slash-and-burn forest clearing has become critical. With a view to determining this and other developments, the United Nations Environment Programme (UNEP) has defined indicators intended to support countries and regions in measuring progress towards the UN Millennium Goals. The 2002 Johannesburg Plan for the implementation of these goals emphasises the need for such indicators as a solid basis for monitoring and decision-making by policy-makers. Southeast Asia is one of five Asian sub-regions that have been determined by UNEP. The others are Central Asia, South Asia, Northeast Asia, and the South Pacific. All reports include graphic representations of the trends of over 25 key indicators for air, water, land, biodiversity, social and economic development. In many of these spheres there is still a lack of sound scientific data as a basis for assessing progress in development. South America: Soy or forests? Soy is a trade crop of international importance, as it is predominantly processed into fodder or oil. Global demand for these products is growing continually and cannot be met by increased yields alone. This is the reason why, in recent years, soy cultivation areas have been expanded – at the expense of both other crops and natural ecosystems. This trend is likely to continue, particularly in Brazil, Argentina, Paraguay, and Bolivia, since these countries still have reserves of arable land. Today, soy is already the most important agricultural export product from these countries. However, intensified soy cultivation has problematic impacts on the environment: valuable forest areas are cleared, causing increased risks of erosion and growing contamination with pesticides. A study now suggests combining soy cultivation and livestock farming. This type of intensification of agricultural production could significantly reduce the clearing of forests. However, the authors also emphasise the fact that widespread industrial agriculture is generally problematic from an ecological point of view, and cannot solve social problems such as inequitable distribution of income. Economic alternatives for small-scale farmers and the introduction of ecological and social criteria for products by soy buyers could help promote sustainable development. What measures can enable a fruit farm to enhance its ecological value added? How can pests be held at bay with the aid of beneficial organisms? What function do fallow areas have in agriculture, and how are they established? How can the ecological quality of agro-ecosystems be evaluated? These and many other questions are addressed in a new book full of concrete, abundantly illustrated ideas and impulses. The publication deals with those aspects of biodiversity that are of immediate use to farmers, such as, in particular, biological pest control. The first part elucidates the concept of multifunctional agriculture, along with forms and functions of ecological infrastructures. The main part shows how this concept can be implemented in various agroecosystems. Finally, the book presents methods for measuring and improving ecological quality and sustainability in general. demand, this publication offers farmers and consultants a practice-oriented tool. Although the book strongly focuses on European moderate zones, a large portion of the content is relevant also for other continents. Launched during the 3rd IUCN World Conservation Congress (Bangkok, 17–25 November 2004), the Katoomba Group's Ecosystem Marketplace is the first online source of information on markets for ecosystem services. These markets represent a great potential for a large number of stakeholders at very different levels, as well as for communities, financial agents and the business world. The primary objective of this initiative is to provide users with information on the existence of these markets, on who is buying, who is selling and at what price. Visitors can also subscribe to an ”eNewsletter” with fortnightly updates. The website also has a Marketwatch section (still under construction) with information on biodiversity markets, carbon markets, water markets and other conservation markets, detailing their location, transaction values, the carbon sequestered and the protected or restored land area. The Marketwatch page will soon list the prices and locations of buyers and sellers. This online market place should facilitate transactions between the different users and providers, and perhaps help to promote new markets. Following the Environmental Impact Assessments (EIA), which were targeted at the ”project” level, the importance of concerted action at the national and international ”macro” level became clear. As a result, countries and international institutions introduced new tools to carry out strategic environmental assessments of different plans, programmes and policies. This review consists of a collection of experiences in developed, transitional and developing countries. It presents the many varied approaches taken by multilateral and bilateral development agencies, and shows that some analyses deal with integrated (sustainable development) rather than strictly environmental strategies. For example, the ”World Bank” has developed a summary matrix to analyse the poverty and social impact analysis of policy change. Also, an analysis grid is applied in environmental assessments of the Poverty Reduction Strategy Papers (PRSP) of Vietnam. The authors conclude that the future challenges for SEA lie less with the methodology and more with a clearer and better understanding of assessment tools and the appropriation of their results by decision makers. The idea is to have the necessary instruments to illustrate the impact of sustainable development policies. In the end, however, it will be the impact of the information transmitted that will be decisive to the improvement of strategies and policies. Human and economic losses caused by natural disasters are rapidly increasing throughout the world. Although international awareness of this phenomenon has grown, most regions lack adequate local disaster reduction strategies. Central Asia is considered particularly instable with regard to its tectonics and geomorphology. Efforts towards sustainable development are severely hampered by natural disasters and creeping erosion processes. 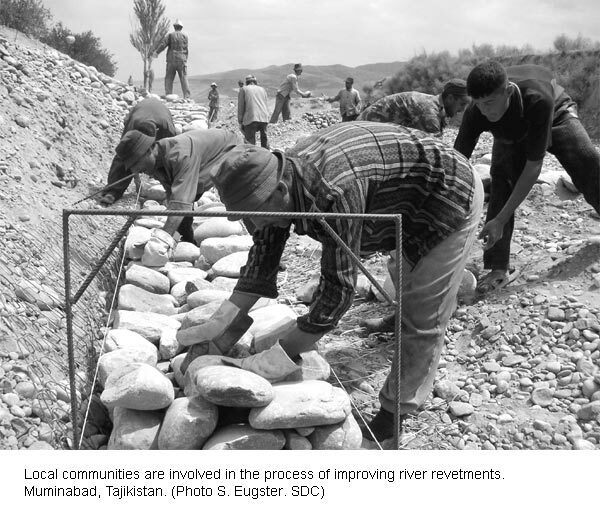 The Swiss Agency for Development and Cooperation (SDC) has developed a Disaster Reduction Strategy for Tajikistan, Kyrgyzstan and Uzbekistan, which will guide the Disaster Reduction Programme for Central Asia during its first phase until 2008. An accurately recorded regional risk profile and the specification of horizontal and vertical forms of cooperation among all institutions involved form the strong points of this strategy. Its main goals are to intensify the population’s awareness with regard to disaster reduction, as well as their risk assessment capacities. In accordance with this integrative approach, the definition of priority measures and a detailed strategy plan are intended to facilitate risk and disaster management. In future, aspects of risk minimisation shall be better integrated in the corresponding countries’ general development concepts. Managing change: A key to sustainable livelihoods? In an integrative manner, this book brings together various contributions on rural livelihood systems in semi-arid India. It raises important questions about capturing the complexity of such systems and managing natural resources and change. 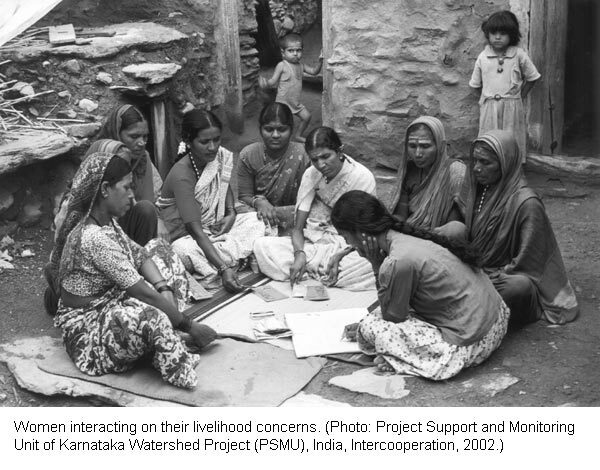 The book elaborates on interrelations between livelihood systems and the forces of their larger contexts, and points out the links between macro-economic policies and rural household economy. The contributions are based on experiences and insights gained from a six years research project that has been conducted in Andhra Pradesh, Karnataka and Gujarat and gained national and international visibility. This volume will contribute substantially to helping people understand local livelihood systems and the reasons why effective development requires a holistic view. It is not about models, but about participatory research tools and translating livelihood research into development practice. The case studies presented all deal with challenges frequently faced by development practitioners in search of approaches that foster empowerment. Source: In search of sustainable livelihood systems: Managing resources and change. Ruedi Baumgartner, Ruedi Högger (Eds.). New Delhi, Sage, 2004. 382 p.
From 27 to 29 April 2005, the European Forum on Agricultural Research for Development (EFARD) will hold its next general meeting in Zurich, Switzerland. Entitled ”Agricultural Research for Development: European Responses to Changing Global Needs”, the EFARD Conference will examine the implications of current global trends with regard to agricultural research for development (ARD). EFARD is a joint effort undertaken by all ARD stakeholder groups – researchers, policy makers, farmer organizations, NGOs, and the private sector – to mobilise the scientific community and strengthen the contribution of ARD to food security, poverty alleviation, and sustainable development. The conference will serve as a platform for strategic dialogue, scientific exchange, and development of joint activities among all involved stakeholder groups. A number of plenary sessions will address the current and future ARD agenda and the mechanisms coordinating European ARD. A series of scientific parallel sessions will cover a wide range of ARD issues and present new ARD approaches. Several workshops will emphasize on finding new solutions through partnerships.